Patrick Eaves, who was limited to just two NHL games in 2017-18, can’t wait for the puck to drop on the new season. But before it does, the right wing has one order of business to take care of. Patrick Eaves, who was limited to just two NHL games in 2017-18, can’t wait for the puck to drop on the new season. But before it does, the right wing has one order of business to take care of. The voice that greets you on the other end of the line is a happy one. For starters, it’s Eaves’ oldest kid’s birthday. But there’s another reason, a big one, as to why the 34-year-old is smiling these days. “It was very trying year,” said the Anaheim Ducks forward who was forced to the sidelines after initially being diagnosed with Guillain-Barre syndrome, a condition where a person's immune system attacks the nervous system. Doctors later concluded that Eaves was experiencing post-viral syndrome, which can be triggered by a viral infection. Eaves, who came to the Ducks via a trade from Dallas February 24, 2017, turned to several people for support since his diagnosis last October. “The only reason I’m able to come back and play this year is because of the people that I’m surrounded by,” said the veteran of 626 regular season NHL games. “It starts with my wife, my kids, my family, the trainers and everyone that has helped me. Before that happens, Eaves will attempt to net his fourth straight Smashfest title. 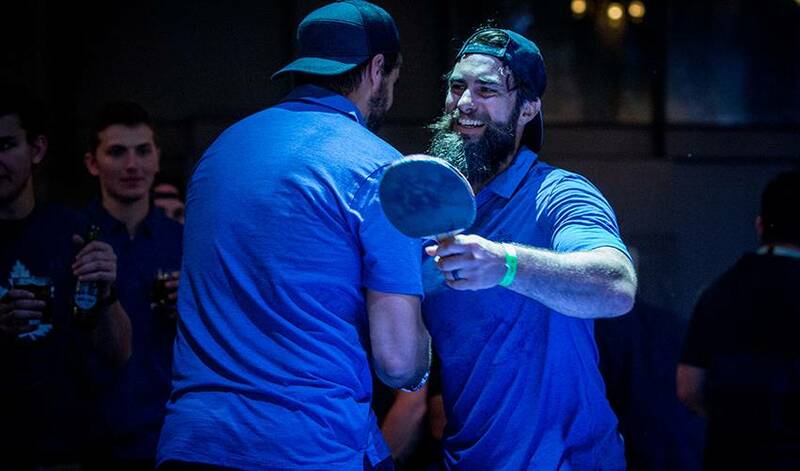 The seventh annual Charity Ping-Pong Challenge, founded by fellow NHLPA member Dominic Moore, will take place Wednesday, August 1 at Steam Whistle Brewing in Toronto. The fan-inspired event, supported by the NHLPA, showcases NHL players’ ping-pong skills while raising money and awareness for research into concussions and rare cancers. Moore won’t make it easy for Eaves in his quest for a four-peat. Don’t expect the 29th overall pick of the Ottawa Senators in 2003 to hit the table tennis circuit any time soon. How would a Smashfest title, a return to NHL hockey, followed by a Stanley Cup win sound? William Nylander had one mission in mind when it came to Smashfest VII: get the better of anyone who wears a blue and white hockey sweater. It was competitive, it was fun, and as four-peat champion Patrick Eaves put it best, everyone walked away a winner. Dominic Moore, Connor Brown and James van Riemsdyk to stop by Bay/ Wellington in Toronto tomorrow to promote Smashfest® Charity Ping-Pong Challenge. “When I look back on my career highlights, those two games were so memorable,” said Moore, whose 14-year pro career has him eight games shy of 1,000 combined regular season and playoff games. Created and hosted by Dominic Moore and supported by the NHLPA, Smashfest continued to grow its efforts Thursday to help fund concussion and rare cancer research with Smashfest VI, one of the most unique charitable experiences that has now raised over $665,000 to date. Charity Ping-Pong Challenge supported by the NHLPA raises funds for concussion & rare cancer research.